MUMBAI: MTV has announced its new take on freedom through "Maa Kasam Hindustan" with MTV ACT. The initiative has been launched with series of campaigns that urge the youth to stop being a fence sitter; but to take a stand and take action against issues that concern them. The campaign is based on MTV ACT philosophy that every action counts -no matter how small it is. And, is backed with numerous initiatives that are supported under MTV ACT s pro social platform. Leading the campaign, John Abraham and Nargis Fakhri have joined hands with the MTV VJs to bring about a change. All the MTV VJs & faces – Anusha, Gaelyn, Nikhil Chinapa, Cyrus Brocha, Rannvijay and Raghu will participate in the campaign by taking their very own Maa Kasam oath on-air. Each promo will feature one VJ talking about that one change they would like to bring about in India. Right from conservation of paper and animal welfare to racial discrimination and cleanliness, the campaign will see the VJs taking a pledge for all. Each person pledges their action to make a difference to life surrounding them. Lead musicians including AR Rahman, Salim Suleiman and Papon, are also taking the pledge by "Maa Kasam Hindustan". Starting August 12, 2013 the campaign will engage with the youth till the end of the month. This pledge by swear campaign is backed by MTV’s own pro social platform MTV ACT that enages with over 20 NGOs and independent organizations to support cause baaed initiatives across verticals like environment, recycle, education and animal welfare. In past, MTV ACT has worked with Greenpeace, TeachIndia, SIFE, Peta, Akanksha etc. to support multiple causes across these verticals. In addition to John Abraham, Nargis Fakhri and the MTV VJs, the Maa Kasam Hindustan campaign will also feature the youth who have pledged to do their bit for the nation. It will also see extensive digital promotions and on-air promotions. For those who want to pledge to make a difference this Independence day can log on to www.mtvindia.com/maakasam or they can simply select any one or more causes that they would like to lend support to through MTV ACT . Youth can support across causes by donating time or money to the NGOs working for the cause. 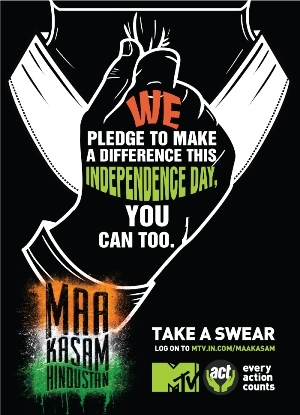 This Independence Day take a pledge, be the change maker with Maa Kasam Hindustan only on MTV! MTV ACT – every action counts!